Rosa Genoni (Tirano, 1876 – Varese, 1954) was a pioneer in several fields. She was a founding mother of transnational feminism, of peace activism and of the Made in Italy when it was still imagined. She was the first woman to be awarded the International Jury Prize for her dress designs at the Universal Exposition of Milan held in 1906. Genoni achieved international recognition as a result of her opposition to World War I. She was the Italian delegate at the 1915 First International Women’s Conference in The Hague. 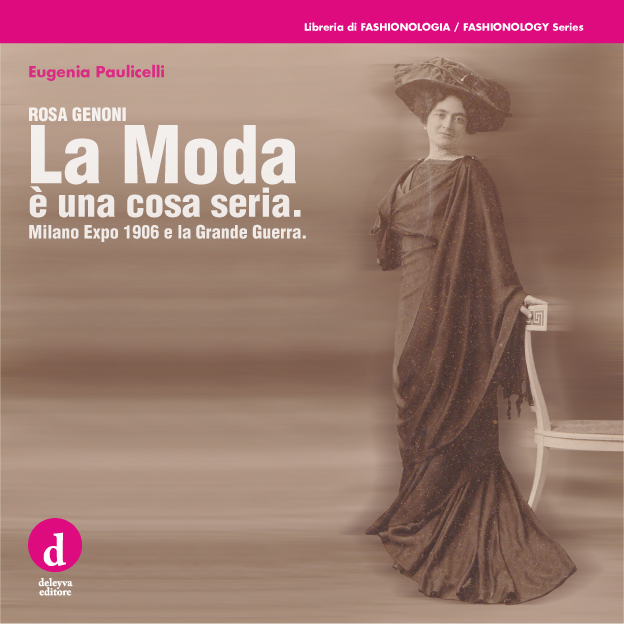 This first historical and analytical essay, in a bilingual edition, reconstructs the life and career of Rosa Genoni, connecting her multiple activities in the fields of fashion and design and their impact on national identity. The case of Rosa Genoni and the multiplicity of her life allow us to understand the long history of the Made in Italy and the relationship between tradition and innovation. To study fashion can revolutionize the writing of history. Rosa Genoni è stata una pioniera in molti campi. Una delle fondatrici del femminismo internazionale, del movimento della pace e del made in Italy quando ancora non si immaginava. E’ stata la prima donna a ricevere il premio della giuria internazionale all’EXPO di Milano del 1906 per i suoi abiti e l’unica delegata italiana al Congresso Internazionale delle donne, tenuto all’Aia il 28 aprile 1915. Questo è il primo saggio storico e analitico, in edizione italiana e inglese, che ricompone la vita e la carriera di Rosa Genoni, collegando le sue molteplici attività nel campo della moda, del design e dei loro rapporti con la costruzione dell’identità nazionale. Il caso della Genoni è esemplare. La poliedricità della sua vita personale e politica apre alla comprensione della lunga storia del made in Italy e del rapporto tra tradizione e innovazione. Studiare la moda può rivoluzionare il modo di scrivere la storia. Eugenia Paulicelli is one of the pioneers of the new history of fashion, whose broader objectives are very clearly set out in the brief essay on the life and career of Rosa Genoni. Genoni’s life and career is a model of what can be learned from a critical and analytical history of fashion and Eugenia Paulicelli convincingly makes the case that because “fashion is a serious business” it deserves to be taken seriously by historians. Paulicelli’s essay invites us to start anew in order to interrogate the depth of a past-present and a possible future of a Made in Italy fashion with a different awareness of the sense of time and identity that is inscribed in it and opening up to an interesting problem that bears not only in the history of fashion but also on historiography, that is on the ways of making and writing history.